The Lone Peak is Altra’s most popular trail shoe in their range and has a great following, from the more casual runner running road to trail, to walkers hiking long days and all the way up to those running 100 mile Ultra Trail Races! One of the main reasons for this is, as with all Altra shoes, the Lone Peak is foot shaped. This allows the feet to function within the shoe, as the wide rounded toe box has plenty of room for the toes to wiggle and the feet to expand. That means there is less chance of blistering and hot spots, that are common in shoes with a more ‘pointy’ toe box. Again like all Altra running shoes, the Lone Peak is Zero Drop. This encourages a more natural posture, allowing the load to be spread out over the whole of your body as nature intended. Compared to higher heeled shoes, where the feet and ankles are practically disabled, passing a lot more shock onto the knees, hips and lower back. The cushioning is great too, with a stack height is 25mm, which appeals to a lot of runners and walkers out there too. So, how have Altra improved on previous version of this popular shoe when creating the Lone Peak 4.0 ? The first noticeable thing when you put the Lone Peak 4.0 Mesh on is that the fit is so much better than the previous versions. Like in the Altra Torin 3.5 Mesh, the upper just pulls in around the foot. There is no plastic heel cup which is good news for those with heel spurs or other lumps and bumps on the back of the heel. When you lace the shoes up the heel and midfoot just takes the shape of your foot. This does make the toe box feel more roomy and airy than previous models, which in itself feels great, as your toes can freely wriggle and spread out. The effect is that your foot relaxes into the shoe instead of being forced into the shoes shape. The less padding around the heel cup and the thinner mesh upper all add to this improved fit. The mesh is designed to be more abrasion resistant then previous uppers and the overlays at the base of the upper have small holes in them to help any water that gets into the shoe get out. The Lone Peak 4.0 is noticeably more flexible than all the previous versions of the Lone Peak. The Lone Peak 2.5 is the nearest in flexibility. This flexibility also comes with more ground feel making the Lone Peak a much better shoe on the rougher trails. The previous version although plush and well cushioned was a bit numb on any real off road trails. The Lone Peak 4.0 has rectified that and feels good on single track trail or farmers fields. The outsole has also improved the feel and grip of the shoe. The Maxtracs outsole is grippy enough for most surfaces. The lugs aren’t too long that they are noticeable on road or firmer trail but long enough for all but the most muddy trails. The rubber is also a sticky rubber which is great on everything from wet roads, stone steps to wet wooden bridges. The Lone Peak 4.0 has a stone guard built into the midsole. It is placed between the EVA and A Bound materials and is designed to protect the feet from thorns or sharp rocks pushing through the midsole into your foot and on very rocky trails reduce the chance of getting bruised feet. By not placing the stone guard at the bottom of the midsole, but in effect half way up the midsole, Altra have avoided making the sole too stiff. So you won’t get thrown about by the midsole when you run over broken ground as the bumps in the ground will be partially absorbed by the bottom bit of the midsole. Also by not putting the stone guard on top of the mid sole they have avoided the shoes feeling initially hard. Although the shoe now has more feel and flexibility, this does reduce how soft the cushioning feels. So if your trails are mainly hard compact trails and you like a lot of cushioning then you might prefer the Altra Timp rather than the new Lone Peak 4.0. For me personally the cushioning level is enough and I have happily run on mixed routes for up to three hours without feeling the need for more protection. The Lone Peak 4.0 is still more cushioned than the lighter and more flexible Altra Superior. The new Lone Peak 4.0 is probably actually a better level of feel and cushioning for UK trails than the previous models for most runners. The potential trouble with stickier outsole is that they are made of a softer rubber and therefore wear out a touch quicker than harder, more durable rubbers. The outsole rubber on the Lone Peak 4 seems to be holding up. I have done a few hundred miles in the shoes now and although there is some wear it is only minor. Most of my runs start with a few miles of disused railway line which has large section of tarmac and some of my longer runs have been 50% tarmac and 50% muddy trails so if the rubber wasn’t very durable then I would know by now. 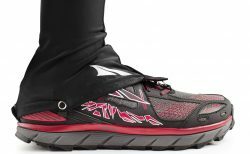 The Altra Lone Peak 4 has the fixing points to take the Altra 4 Point Gaiters. These are designed to stop stones and other debri getting into the shoe. They also bridge the gap between your shoes and tights which makes you a little warmer on cold days. Size wise the Altra Lone Peak 4 Mesh fits more like the Altra Lone Peak 3.0 than the 3.5 which was a bit on the small side. If you have an Altra Lone Peak 3.5 then depending on how much room you have in the shoes you may be better with half a size smaller in the Lone Peak 4.0. If in doubt then send us an email. Topo Terraventure: These have a similar rounded foot shape to the toe box, They are 3mm from heel to forefoot and offer enough cushioning for mixed terrain including some road. Inov-8 Terraultra: The mesh uppered version isn’t as broad as Altra or Topo but, still has a rounded less pointy shape. The cushioning isn’t as soft and for a lot of people won’t be enough for runs that are 50% road and 50% trail. Hoka Torrent: Hoka’s are narrow shoes with a very soft cushioning. The Torrent is less cushioned than the Hoka Challenger which is a road shoe with a bit of grip. This slightly lower stack height makes the Torrent better shoe for more broken terrain but, like the Lone Peak it still has enough cushioning for most runners to use in mixed runs that have 50% or so of tarmac in them.